TZ-008 Sushi trays and lids. Each order contains 50 pieces of bases and 50 pieces of clear lids. 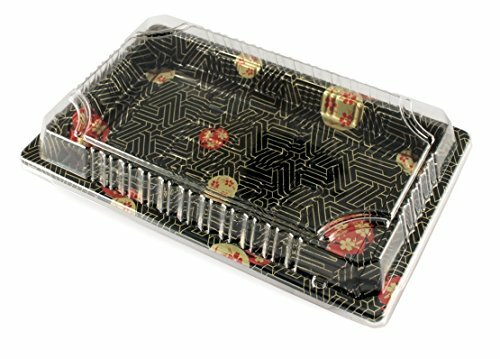 The bases feature a Japanese decoration enhancing sushi presentation.The lids snap lock with a tight fit to protect food from airborne contaminants. .Each order contains 50 pieces of bases and 50 pieces of clear lids. 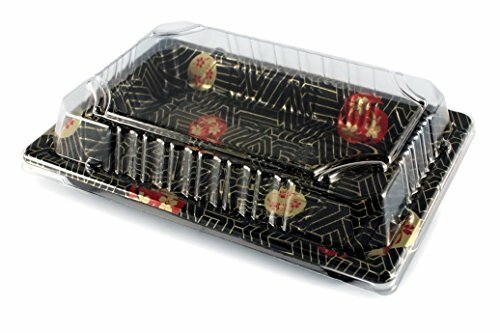 The bases feature a Japanese decoration enhancing sushi presentation.The lids snap lock with a tight fit to protect food from airborne contaminants. Base 1 3/8 X 5 1/8 X 7/8.